One such considered above criticism, sacred as motherhood, is TVA. This program started as a flood control project; the Tennessee Valley was periodically ravaged by destructive floods. The Army Engineers set out to solve this problem. They said that it was possible that once in 500 years there could be a total capacity flood that would inundate some 600,000 acres (2,400 km2). Well, the engineers fixed that. They made a permanent lake which inundated a million acres (4,000 km²). This solved the problem of floods, but the annual interest on the TVA debt is five times as great as the annual flood damage they sought to correct. Of course, you will point out that TVA gets electric power from the impounded waters, and this is true, but today 85 percent of TVA's electricity is generated in coal burning steam plants. Now perhaps you'll charge that I'm overlooking the navigable waterway that was created, providing cheap barge traffic, but the bulk of the freight barged on that waterway is coal being shipped to the TVA steam plants, and the cost of maintaining that channel each year would pay for shipping all of the coal by rail, and there would be money left over. The publicity Reagan gained in part from this speech paved the way for his election as governor of California in 1966, when he unseated the two-term Democrat Edmund G. "Pat" Brown, Sr. Brown was the father of Reagan's Successor, Governor Jerry Brown. Michael Reagan, adopted son of Ronald Reagan and Jane Wyman, contends that Attorney General of the United States Robert F. Kennedy pressured GE to cancel The General Electric Theater or at least to fire Reagan as the host if the program were to continue. The series was not dropped because of low ratings but political intervention, the younger Reagan still maintains. 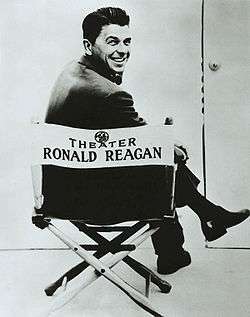 Michael claimed that Robert Kennedy told GE officials that the company would receive no federal contracts so long as Reagan was host of the series. Michael noted the irony that his father's dismissal propelled Reagan into the political arena, and eighteen years afterwards, Reagan would take the oath of office as the oldest person thus far in history to become U.S. President. According to Michael Reagan, Kennedy's directive is another example of the "law of unintended consequences." Had Kennedy stayed out of GE contract matters, there would have been no Governor or President Reagan, speculates Michael Reagan. In fact, the primary reason Reagan was fired by General Electric for his comments regarding the TVA was that the TVA was one of General Electric's biggest customers. General Electric was and remains the largest supplier of equipment to the TVA and most other electricity producers in the United States. ↑ Terrace, Vincent (1999). Radio Programs, 1924-1984: A Catalog of More Than 1800 Shows. McFarland & Company, Inc. ISBN 978-0-7864-4513-4. P. 128. ↑ "Television Obscurities – Another General Electric Theater Episode Found". ↑ "Ronald Reagan". PBS. Retrieved 2007-11-27. ↑ Michael Reagan (February 4, 2011). "Ronald Reagan's Son Remembers The Day When GE Fired His Dad". investors.com. Retrieved February 5, 2011.